MANILA, Philippines - A policeman from Las Piñas is now getting popular online as the video of him singing Ed Sheeran's hit song 'Thinking Out Loud' went viral. Police officer 1 (PO1) Norman A. Wileman III uploaded the video on Facebook late March captioned "Thinking Out Loud - Pulis Version." It was already shared by more than 9,000 times and earned almost 300,000 views in span of two weeks. 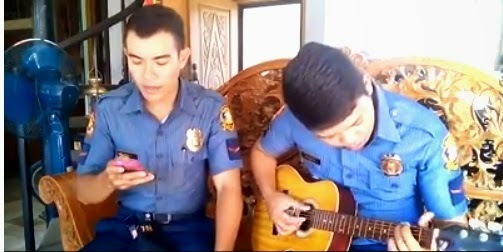 As seen in the video, Wileman sings the popular song while his companion plays the guitar. He belts out the tune while reading lyrics from a mobile phone. Wileman, a graduate of BS Criminology at the Pamantasan ng Lungson ng Muntinlupa was invited already on national television via UNTV as he sang "Warrior is a Child," a tribute to the fallen commandos of SAF. Here's another video posted on Youtube - Wileman's rendition of Love on Top by Beyonce. Is Norman Wileman the next online singing sensation?